Don’t miss the Navy Yard district. After enduring a sports championship drought for 44 years, all eyes were on Washington, D.C. when the Capitals clinched their first Stanley Cup Championship last month. Now it’s baseball fans’ turn to focus on the nation’s capital as the MLB All-Star Game heads to Nationals Park on July 17. Since it first opened in 2008, Nationals Park has transformed the Navy Yard neighborhood into a cool destination in its own right. 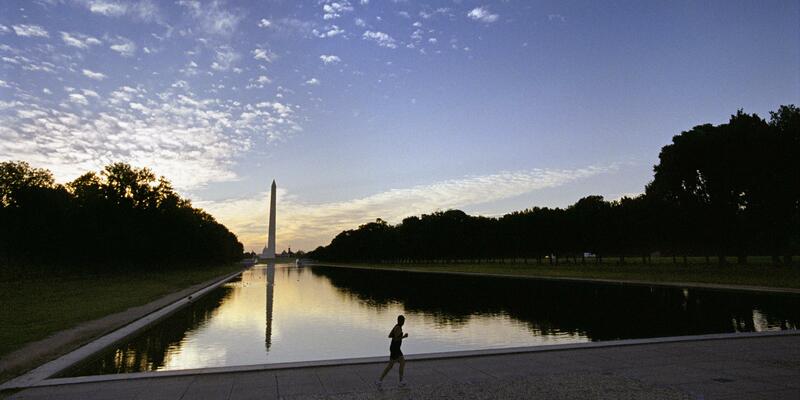 Located on the Anacostia River in Southeast D.C., the once industrial area is now a booming commercial and residential hub boasting four public parks and the Anacostia Riverwalk trail system. Whether you’re attending All-Star Weekend, going for a regular season Nationals game, or just want to see a different side of D.C., here’s what to eat, see and do in the Navy Yard. The boutique Capitol Hill Hotel, self-described as “Federalist chic” is located in the historical district a mile from Nationals Park and a few blocks from the Capitol, Library of Congress, and National Mall. Each room features patriotic decor and bicycles are available for those who want to see the city on two wheels. Or stay at the Liaison in Capitol Hill, which offers a rooftop pool and modern-style rooms that have luxe bath amenities and ample desk space. Get a fresh start to your day at Slipstream, an artisan coffee shop where the menu changes weekly to reflect the best local fare. Order poached eggs, avocado or smoked salmon toast, or the homemade granola and yogurt. From July 13 to 17, All-Star Weekend takes over Nationals Park. Or catch a home game from April through September. 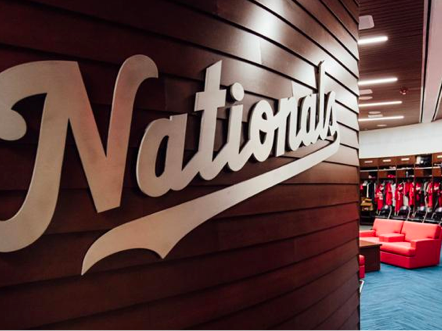 You can also take a Nationals Park Tour throughout the season. If you go on a non-game day, you’ll have extra access to the dugout, press box, and bullpen, plus you’ll get to throw a pitch. The Ballpark Boathouse allows you to see the historic Navy Yard, U.S. Capitol, USS Barry, and Fort McNair from the water. 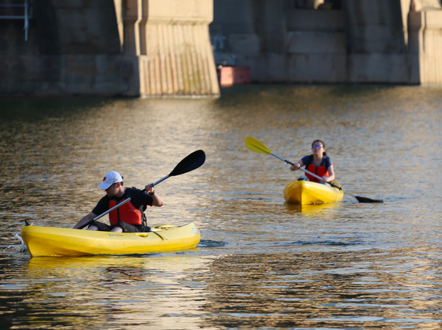 Rent a kayak or canoe for a leisurely paddle, or sign up for the Twilight Tour to catch the sunset. You can also try standup paddleboarding with Capital SUP, which offers rentals and lessons. While most food options at Nationals Park are your typical stadium fare (hot dogs, pretzels dunked in beer cheese or fried chicken and waffles), the Budweiser Brew House at the Center Field Plaza serves a fresh berry salad and Mediterranean dips, or the Healthy Plate concession stand at section 114 offers grilled veggie wraps, shrimp Caesar salad, and California sushi rolls. End the day at the Salt Line Oyster + Ale House, a waterfront dinner spot that fuses New England and Chesapeake seafood. Start with fresh oysters such as the Harris Creek from Maryland, then move onto a tower of clams, shrimp, lobster, and crab. Before you head back to the hotel, catch one last river view in the Rosé Garden at Whaley’s restaurant, where 10 different rosé wines are served in an outdoor bar studded with tropical plants. Make your way to Protein Bar + Kitchen, where every entrée promises to contain at least 15 grams of protein. Fuel up for the day with a spinach and pesto wrap. 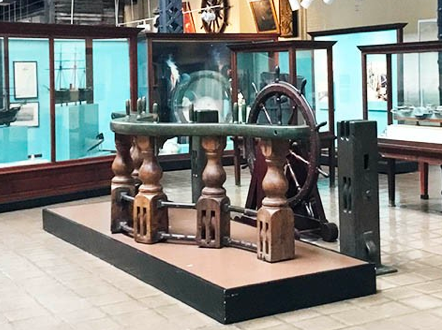 Visit the National Museum of the U.S. Navy, which opened in 1963 to give civilians insight into the Navy’s history, heroes, battles, and peacetime contributions such as explorations and space flights. Once inside, be sure to visit the Forgotten Wars of the Nineteenth Century and interactive submarine exhibits. From now through April 2019, the Playball installation explores the relationship between baseball and the Navy, looking at how the importance of fitness in the forces helped the sport flourish, especially during wartime. Get a bird’s eye view with a workout at Trapeze School. Experience an adrenaline rush as you leap in the air during the flying trapeze class, while connected by safety lines. Instructors will help you work on your balance and agility for the landings. You can also take an acrobatics class, in which you’ll practice partner lifts that strengthen the upper and lower body, and core. Afterwards, make your way to Steadfast Supply, a haven for designers, artists, and creatives from D.C. and around the country to share their work in a hip warehouse space. For dinner, make a reservation at Blue Jacket. It’s housed in the industrial-style Boilermaker Shops building, which dates back to 1919 and was once part of the Navy Yards ship and munitions manufacturing complex. Start with the smoked trout dip to share, a locally-sourced salad, and side of cauliflower, followed by rotisserie chicken or grilled kielbasa. End the evening under the stars with outdoor entertainment at Yards Park. Every Friday from May to September there is a concert on the waterfront with local bands playing from 6:30 p.m., and Thursday is movie night. Bard in the Park screens films adapted from Shakespeare on select Wednesdays.